Experience the latest of Mi – from India’s best- selling smartphones to smart devices to a range of ever-growing list of accessories, firsthand. Mi knowledgeable staff provides you with a comprehensive product consultation and helps you to buy a product which fits your needs. Whether it be product specification, operational guidance, or an unsettling urge to deep dive and understand the product even better, MI team will answer all of them, one by one. Offer: Pre-book your smartphone for ₹299 and avail an instant discount of ₹500 during purchase on 10th November at Mi Home, Seasons Mall, Magarpatta City, Pune. 1.Pre-booking is only open for Mi Home, Seasons Mall, Magarpatta City, Pune. 2.Please pre-book only if you are a Pune resident and can redeem the pre-booking voucher in person on 10th November. 3.The said offer is valid only on pre-bookings made from 6th November (10AM) to 9th November (11:55PM) through Mi.com (all platforms). 4.Pre-booking offer is only valid on smartphone devices. 5.Citing limited availability, the user can only pre-book only one device per email address / mobile number. 6.User(s) can add only 1 device to their cart for checking out successfully. If more than 1 order is placed using the same email ID / mobile number, other orders will be automatically cancelled and a refund will be initiated towards the original source of payment. 7.The pre-bookings orders are non-transferable and non-refundable. 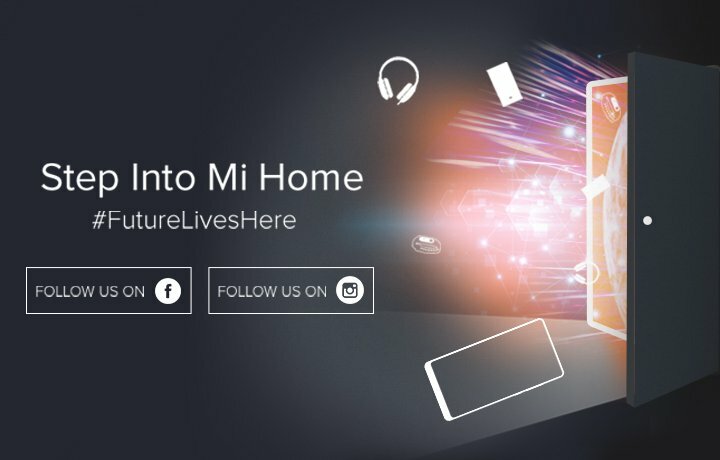 8.For a better shopping experience & reduced wait-times, we are requesting all our pre-booking customers to visit the Mi Home along with the pre-booking email confirmation & government-issued ID card as per their selected time-slot. 9.The pre-booking payment of ₹299 will let you avail a flat discount of ₹500 on your pre-selected smartphone and the discount amount will be adjusted against your final bill. For example: If you have chosen Redmi Note 4 (4GB + 64 GB), the final payable amount will be ₹12,499 post accounting the instant discount of ₹500 which was availed by pre-booking the device for ₹299 on mi.com (all platforms). In this case, the selling price of Redmi Note 4 (4GB + 64GB) is ₹ 12,999. 10.Customers, who have opted for pre-booking of smartphones for ₹299, will receive an instant discount worth ₹500 on successful completion of the transaction. 11.Instant discount worth ₹ 500 with smartphone purchase is not applicable for walk-in customers. 12.We will not be entertaining any cancellations or modifications for pre-booking orders. Please carefully select the device and device color that you wish to purchase. 13.Redemption is at sight by bearer. 14.If not availed by you, the token payment made by you will not be refunded, and will lapse. 15.Xiaomi Technology India Pvt Ltd reserves the rights of admission. 1.Please carry the pre-booking confirmation email & valid government-issued ID proof for verification purposes on Friday, 10th November 2017. 2.You are only allowed to take a maximum of 3 devices: where 1 can be yours and the other 2 are being collected on behalf of someone else. If you are collecting the device on someone else’s behalf, please ensure that you have their confirmation emails & government-issued ID cards with you. 3.Scanned copy / digital image works for us. We are flexible that way. 4.Xiaomi Technology India Pvt Ltd will not release device(s) for anyone trying to collect more than 3 devices. Pre-book your favorite smartphone by just paying ₹ 499 and get an assured gift worth ₹ 999. 1. Please carry the pre-booking confirmation email for verification purposes. 2. Please carry a valid government-issued ID card for verification purposes. 3. You are only allowed to take a maximum of 3 devices where 1 can be your’ s and the other 2 are being collected on someone else’s behalf. If you are collecting the device on someone else’s behalf, please ensure that you have their government-issued ID cards on you. Scanned copy/ Digital image works for us. We are flexible that way. 4. Please note: 1 Customer can only take 3 devices (1 – Their own, 2 – Collecting on someone’s behalf). Xiaomi India will not release device(s) for anyone trying to collect more than 3 device(s). We request your kind cooperation on this as such requests will not be entertained by the on-ground staff. 1. Pre-bookings are only open for Mi Home, 1 MG – Lido Mall, Bangalore. Please pre-book only if you are a Bangalore resident and can redeem the pre-booking voucher in person on July 22nd or July 23rd. 2. The said offer is valid only on pre-bookings made during July 19th – July 21st through Mi.com (all platforms). 3. Citing limited availability, the user can only pre-book only one device per email address/ mobile no. 4. User(s) can add only 1 device to their cart for checking out successfully. If more than 1 order is placed using the same email ID/ mobile no., the orders will be automatically cancelled and a refund will be initiated towards the original source of payment. 5. For a better shopping experience & reduced wait-times, we are requesting all our pre-booking customers to visit the store along with the pre-booking email confirmation & government-issued ID card in the time-slot chosen by them. 6. The pre-booking payment of ₹ 499 will be adjusted against your final bill. For e.g. If you have chosen Redmi Note 4 (4GB + 64 GB), the final payable amount will be ₹ 12,500 post accounting for the partial payment of ₹ 499. In this case, the selling price of Redmi Note 4 (4GB + 64GB) is ₹ 12,999. 7. Customers, who have opted for pre-booking of smartphones, will also receive an assured gift worth ₹ 999 on successful transaction. 8. Free gift worth ₹ 999 with smartphone purchase is not applicable for walk-in customers. 9. We will not be entertaining any cancellations or modifications for pre-booking orders. Please select the device carefully which you wish to purchase. 10. Please carry the soft copy/ hard copy of the confirmation email to avail the offer and the partial payment of ₹ 499 to be adjusted against your final bill.